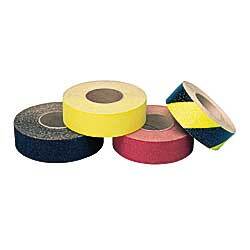 Brightly colored tape outlines work, danger, or off limit areas. Abrasive material provides maximum skid resistance on practically any surface. Super adhesive backing sticks to most floors. Flexible material bends over 90° angles without cracking for use on stairways or ladders. Withstands temperatures from -40° to 220° F. Resists detergents, grease, and oils. IN STOCK.